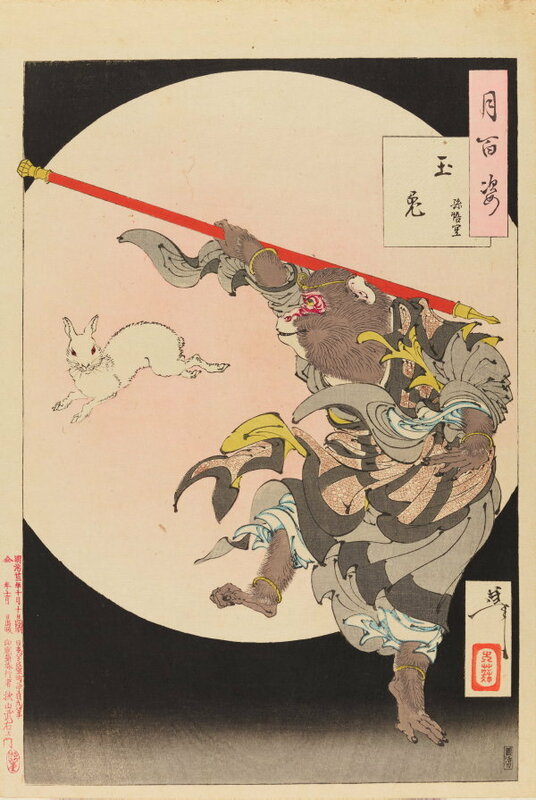 The immortal monkey Sun Wukong, known as Songoku in Japanese, means ‘enlightened emptiness’. Songoku accompanied the priest Tripitaka on a journey from China to India in the seventh century to collect scriptures, and became popular through the Chinese novel ‘Journey to the West’. He gained immortality by breaking into the heavenly garden and consuming the peaches of longevity. Here, his companion is the Rabbit in the Moon, also known as the Jade Rabbit, often associated with mixing the drugs for the elixir of life. Songoku fearlessly holds a magic staff, his favourite weapon used to strike demons.